Delight in Skagway?s fascinating history and spectacular mountainous scenery as you travel to the White Pass Summit and into the Yukon. Ride via a vintage rail car along the White Pass & Yukon Route Railway hearing tales of the Klondike Gold Rush. Next, arrive at Fraser, British Columbia and board a motor coach across White Pass? summit to Tutshi Canyon where you can cross the Yukon Suspension Bridge and enjoy a hearty bowl of bison chili. 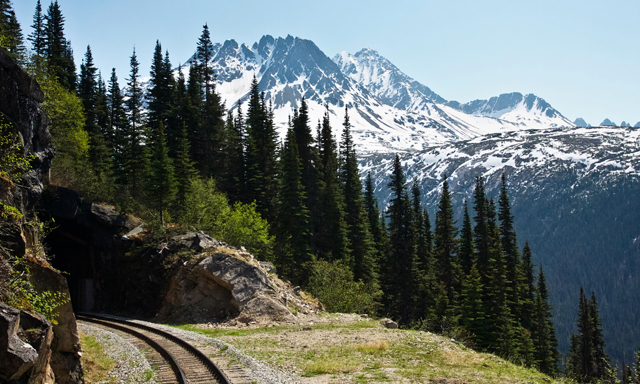 • Scenic Train Ride: Hear Klondike Gold Rush legends while venturing along White Pass and Yukon railway via vintage rail car. • White Pass: Ride in a motor coach around the mountain summit, which was formerly navigated by Chilkoot Indians until 1887. • Yukon Suspension Bridge: Enjoy the exhilaration of crossing the bridge, 57 feet above a class four and five river. • This tour crosses the U.S./Canadian border; therefore, all participants are required to carry their passport and visa, if required. • Written consent is required for children traveling into Canada without both parents.